Killer Characters: Calling All Dear Abbys - Advice Needed! Calling All Dear Abbys - Advice Needed! If you’ve met my friend Geneva, then you know that she’s . . . unusual. To say the least. Because she’s a ghost. Beyond that fact, I don’t know much about her. She claims she doesn’t remember much about her life and she gets upset if I press her to try. From her reaction to the deaths of a young couple earlier this year, there was clearly something traumatic in her own background that she’s blocking out. Her memory, otherwise, especially for dialogue and plot lines from fifty-year-old television shows, is unbeatable. But I’m always looking for historical details she knew firsthand that might help pinpoint when she lived. Here’s a conversation I had with her recently about the reenactment J. Scott Prescott is planning for next weekend. “What was he growing?” Geneva asked. “Potatoes, pigs, and pandemonium,” she said with relish. “Do you remember it?” I asked. “It’s not. He’s sweet on you and you spurned his advance.” Her voice throbbed with pathos for J. Scott. Sigh. I think I could use a few tips for getting along with a melodramatic, histrionic, finicky, persnickety creature, don't you? (And doesn’t it seem like I just described a cat or a teenager?) If you have any suggestions for me, leave them in a comment. I’ll be so grateful! 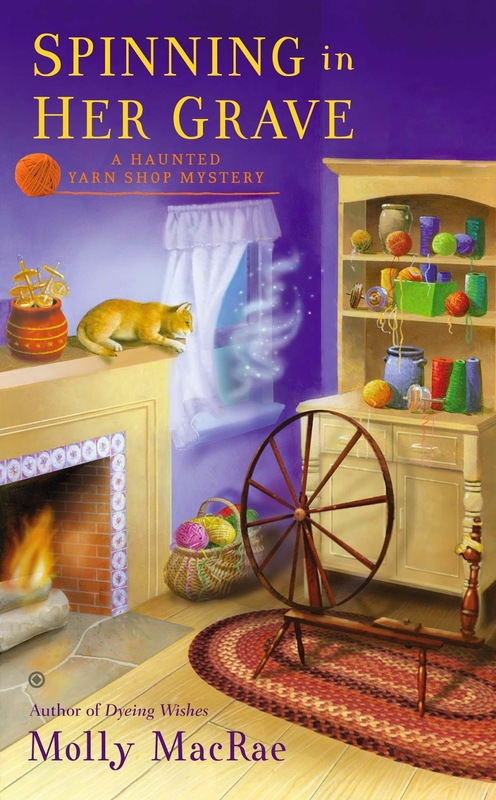 Leave your advice or a comment by midnight 7/23/14 for a chance to win an audiobook of a Haunted Yarn Shop Mystery – your choice of LAST WOOL AND TESTAMENT, DYEING WISHES, or SPINNING IN HER GRAVE. Be sure to leave your email address in the comment to be notified in case you are the winner. Ghost and cats have one major similarity No one can control them in any way. Your best bet is to take a deep breath, hold your tongue and hope they see they see things your way more often than not. Good luck! I have succeeded for several years now. A good sense of humor nad do not take anything seriously. Don't usually read "haunted" stories but this one sounds pretty good. I don't have any suggestions - I have a persnickity dog and she pretty well rules the dog house so I wouldn't be the one to give advice on taming on "problem". I think a sense of humor would help. Give Geneva a ghost of her own to deal with. I imagine it would be really difficult especially if one's ghost wasn't limited to one location (so you can get away). I agree with Sandy, try to have a sense of humor about it. I agree, patience and a sense of humor will help you get through it. Thanks for the opportunity to win # 3! I agree with everyone else. A sense of humor and patience should help. I wonder what she would do if invited along on the dinner date? It depends - do you want the ghost to go away and leave you alone? Usually simply announcing that "this is MY home and you're not welcome here" does the trick. If not, you can smudge with sage or use rock salt to repel spirits. Look at it this way, you'll always have someone to talk to. A good sense of humor helps. Look at it as an adventure! Sounds like a great read. I would let her come to dinner more often! Could be fun! I have found that the only place that I can stand ghosts is in cozies. Maybe it is because they are much nicer there! I'd love to win here. Haven't had any luck so far. I like cozies with ghosts in them. Lol...I would let her go along with you to dinner - she'll either get bored listening in on the date or she'll become fascinated with something or someone in the restaurant and leave you alone to enjoy the date. Ghosts are fun in cozies---they add a little atmosphere. Take her to dinner. She needs a break from the yarn shop! Good luck! I hate histrionics. Have a drink-maybe ask her her favorite cocktails. I love listening to a great book while I am sewing, so this would be fantastic! Give her one new thing that is hers - a fish, plant, perfume, framed James Dean photo. And teach her how to put on the kettle, nothing helps with melodrama like a cup of tea, with or without a quick shot. Not having any personal experience with ghosts, I really don't know what to say.She does seem a big sensitive, so continue being nice to her and maybe she'll finally open up about her past life. A ginger scented candle to go along with the ginger colored kitty might keep her mellow and talking about her past more - her mamma's kitchen and all that has gone on before. Or begin baking in the kitchen where she can feel at home and will have more company from the shop with the wonderful scents wafting through the Weaver's Cat. Set up an area that contains things she likes. Have sense of humor and patience. I don't have any advice. I have a hard time with melodrama. I try to avoid people like that. Sorry. I don't really have any advice. Count to ten. Try to not take it to seriously. Pick your battles. Standard stuff. I think I am inclined to agree, ghosts and cats... best of luck! I love the books with ghosts. I try to avoid the melodrama.